A new force established itself at the forefront of the Blancpain GT Series this season as AKKA ASP and its fleet of Mercedes-AMG entries secured race wins and titles across three classes. Jerome Policand’s squad ended the year by taking the biggest prizes of all: the overall teams’ title, and the drivers’ crown courtesy of Italian ace Raffaele Marciello. AKKA ASP also clinched the Sprint Cup drivers’ championship, a brace of Silver Cup titles, and race wins in the Am Cup. Pending an appeal by the disqualified Black Falcon entry, AKKA ASP might yet add two Endurance Cup titles to that haul. It is the culmination of several years’ hard work: the team began life in the Pro-Am ranks, gradually becoming a contender for outright victories. Though a relatively recent arrival at the very top of international GT racing, the team has been competing and winning across Europe for almost 20 years. Established by long-time racer Policand as Auto Sport Promotion – usually shortened to ASP – the French squad has developed a small crew known for its racer’s spirit and total commitment to the cause. In that respect, it is a team modelled after its founder. Policand’s life as a racer began when he was just six. His elder brother was a Jackie Stewart fan and Jerome started following Formula 1 on TV. Soon enough he was travelling to grands prix across Europe to watch his heroes. The story thereafter is a familiar one: Policand began competing in go-karts, then entered a racing school to earn a move to single-seaters. He won a scholarship to race in Formula Ford and continued climbing the ladder. His ultimate goal was Formula 1 and Policand came close, moving through French Formula 3 and eventually International Formula 3000, the main F1 feeder series at the time. Along the way Policand went up against the best French talent of his generation: Eric Helary and Olivier Panis were F3 rivals, while Yvan Muller was a teammate in F3000. A few emerging international stars caught his eye, too. 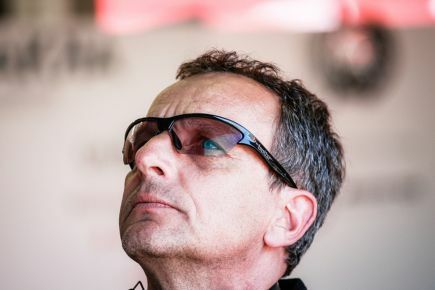 Reaching his late twenties, Policand switched to international GT and prototype racing, including stints in the U.S. and Asia and several starts at Le Mans. But, in truth, he has not fully left it behind. “Sometimes I miss it, but only during the winter. When I am at the track and I have to take care of the drivers, the mechanics and the engineers, I don’t miss it. But you miss the adrenaline of motor racing and the feeling of driving the car. “For sure I will come back at some point,” he confirms. Policand established Auto Sport Promotion to support his own career and was quickly able to achieve on-track success. Nevertheless, he sees AKKA ASP’s recent triumphs in the Blancpain GT Series as the result of a long learning process. “In the beginning I set the team up around me to do the Renault Clio V6 Trophy,” he explains. Policand won that title in 1999 and was given a budget to field another driver the following year, which began to shift his approach. “At the very beginning I was running the team like a racing driver. This was the wrong way to do it, even if we got results. Today, Policand sees the organisation of people as one of his key responsibilities. Finding employees who match his team’s ethos is especially important. “They must have the right spirit and motivation,” he explains. “If you have the motivation, you have done 50 percent of the work. “Most of the people in my team began as students. My old chief engineer is now the team manager; my first mechanic is now the chief mechanic. They are all people who have worked with me and understand the spirit of the team. “And they are very young,” he continues. “Most of my mechanics are 20 to 22 and the engineers are 26 to 31. My chief mechanic is 35, but he’s been with me for 15 years! Policand explains that AKKA ASP’s full-time operation is relatively small – just 12 people – and supported by long-term freelancers. For a typical Endurance Cup race, 28 people run five cars; when fielding five Sprint Cup cars in Hungary, it was just 20 people. The obvious exception is the Total 24 Hours of Spa, where AKKA ASP’s crew of 40 people ran four cars. Policand prefers it this way, believing that bigger does not necessarily mean better. That a crew of just 28 people can field a fleet of five GT3 cars in the ultra-competitive Endurance Cup is hugely impressive. Indeed, Formula 1 team bosses may be wise to study Policand’s efficiency techniques! This year has been more than Policand and his team could have hoped for, culminating in multiple titles and a reputation for metronomic consistency. “To be honest, I never expected this!” says Policand “My goal was to be on the overall podium, because I thought we were not yet completely ready. There is particular praise for Marciello, whose raw speed and race craft in the #88 Mercedes-AMG have been vital to AKKA ASP’s rise. Policand has worked with and competed against many talented drivers over the years, and it is clear from his enthusiasm that he rates the Italian very highly. The support of naming sponsor AKKA Technologies has also been a crucial part of the team’s recent success. Indeed, it goes beyond simply placing logos on the cars. “AKKA is an engineering company, so we have a connection with a few departments to help the team,” Policand explains. “Next year I think we will have one or maybe two full-time engineers from AKKA with us. For them it’s not just a sponsorship deal: they want to prove that AKKA can have a big effect on the race team. As a driver, Policand dreamt of Formula 1. But, for his team, the future is clearly in GT racing. Among his next tasks will be to remain on top in the Blancpain GT Series and conquer the Total 24 Hours of Spa. “Every time I go to a track, I know I have a chance to win. In Formula 1, most teams are aiming to be best of the rest. That’s a strange feeling. For me, at this stage, the only possibility is GT3. “I have to keep the team focussed and win again. That is the next challenge,” he says. It is this unshakable passion for the sport that has made AKKA ASP so formidable. Indeed, there are echoes of the six-year-old, sitting with his elder brother watching Jackie Stewart, in Policand’s enthusiasm. It filters through to every level of his team: speaking after clinching the overall title, Marciello explained how happy he was to work with a real racer like Jerome. In doing so, the champion summed up a feeling that extends throughout the whole AKKA ASP crew. As Jerome puts it: “If you have the motivation, you have done 50 percent of the work.” But, given his passion for the sport, you get the feeling that it is not work to him at all.